I inherited my life-long love of gardening and flowers from my grandmother. Over time, my passion grew into a business - The Flower Smithy. My first "clients" were family and friends, that hasn't changed. We are, and will always be, a small family owned business. I highly recommend flowers by The Flower Smithy. Susan’s talent for creating gorgeous flower arrangements is just one reason to hire her. She has extensive knowledge with regard to using particular flowers at certain times of the year, which is important since you want your flowers to last through the whole ceremony and reception. Susan went out of her way to make our my wedding bouquets and other arrangements absolutely beautiful. She was prompt to all meetings and on the day of the wedding, she and her team worked tirelessly to make it all happen. Susan is a lovely lady to work with! The Flower Smithy is the best! The Flower Smithy. owned and run by Susan, was such a pleasure to work with for our daughter’s wedding. We actually contacted Susan based on previous five star reviews and The Flower Smithy completely lived up to every glowing review. We were planning our daughter’s Nashville wedding from out of state and Susan was very accommodating to meet with us during our limited time when we visited Nashville. From our initial telephone conversation, to meeting Susan at the flower mart so our daughter could see what kind of flowers she liked, to coming with us to view the layout of our venue, to inviting us to her home workshop to discuss exactly what our daughter and fiancé wanted, to sending us inspiration pictures….Susan and her husband, with their calm manners, were pure professionals and completely welcoming. Since we didn’t know exactly what we wanted, Susan was able to bring to life a vision just by talking with us and having our daughter pick out the flowers and colors she liked at the flower mart. Susan went above and beyond in creating our daughter’s bridal and bridesmaids bouquets, boutonnieres, flower girl headpiece, flower toppers for lanterns placed down the aisle, two types of table centerpieces for round tables plus garland with blooms and candles for head table, cake flowers, greenery and flowers for a memorial bookshelf and huppah floral arrangements - all within staying on budget. Not only did Susan create the flower arrangements for the huppah we used, she offered (without us asking) to purchase fabric, sew and install the draping canopy which turned out so beautiful. Susan and her husband were so easy for us to work with. And everything was delivered and set up right on time. Throughout our planning stages Susan was creative, talented, accessible and flexible. 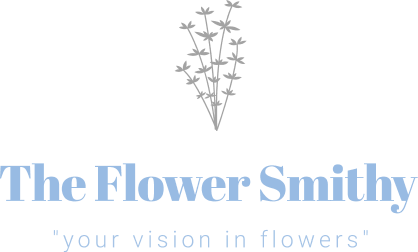 We highly recommend The Flower Smithy!